W. W. Norton & Company, 9780393069143, 295pp. Today's brides are bombarded with wedding advice that promises perfection but urges achieving it through selfishness ("It's your wedding, and you can do whatever you like"), greed (choosing the presents that guests are directed to buy), and showing off ("This is your chance to show everyone what you're about"). Couples wishing to resist such pressure see elopement or a slapdash wedding as the only alternatives to a gaudy blowout. But none of these choices appealed to a bride who happened to have been brought up by Miss Manners. 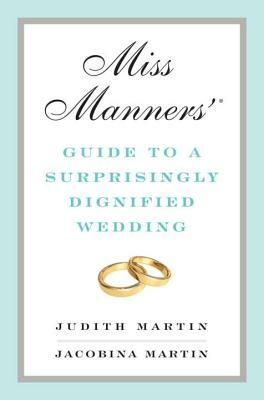 Judith Martin and her newlywed daughter, Jacobina, explain how to have a dignified ceremony and delightful celebration without succumbing to the now-prevalent pattern of the vulgar, money-draining wedding that exhausts families and exploits friends.